To view and download the resource pack, please CLICK HERE or scroll to the end of the post (it's a Google Drive public folder which will open in a new tab). Click on an item to preview it and then click the down arrow to download it. For explanations of the resources, their background and other links, please read below. For my second year in teaching, I wanted to brand the APP Reading objectives for my Reading display. I based the branding on the Screen Beans (found in Clip Art!) and edited the planning so that each objective was clear. Part way through the year, my team decided to change from Guided Reading (carousel-style) to whole-class teaching of reading, much like we did for maths and other subjects (read why and how we did that here). The other teachers in the team liked the logos I'd created and so we started using them as a year group, referring to the words and displaying the logo when children were working on that skill in a lesson. To support this, I also created RIC target sheets and printed some sticker sheets for each of the logos and words so that teachers could indicate in the work which skill had been achieved using a logo sticker. Each objective had a logo and a word which the children began to know inside out. The branding drove our change to the new planning and, through the three most important skills of retrieval, interpretation and commenting on the author's choice, we named the Screen Bean RIC. With the new curriculum comes a farewell to APP and a new set of objectives. Therefore this new resource pack is based around the new 2014 Curriculum objectives, instead of APP. Retrieval, interpretation and choice are still important so the character, RIC, remains with some slight alterations to the other objectives. Logos for each objective, with and without the word, including a set of circle ones. Questions and Hints for each objective, for display. An editable PowerPoint of all the above. 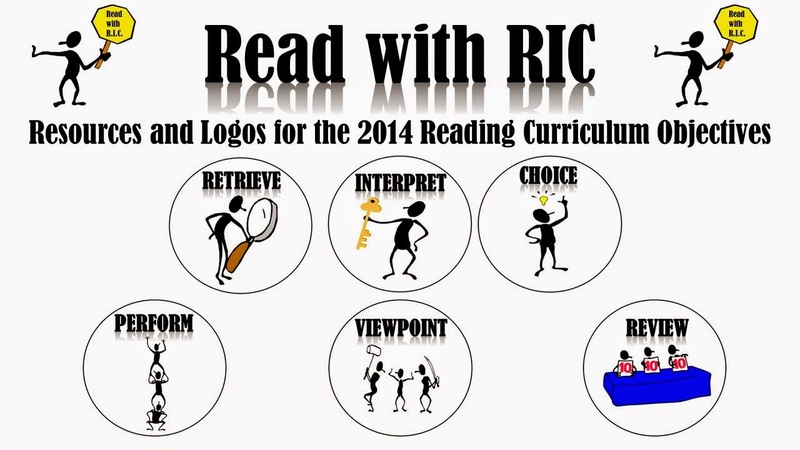 Various logos for "Read with RIC"
Examples of the RIC (Retrieve, Interpret Choice) starters which we use. NEW: Assessment/Objective sheets for upper and lower Key Stage Two. To find out more about our journey from carousel guided reading to whole-class lessons, click here (will open in a new tab). I appreciate any comments on the resources (including any errors or typos), links to other posts about Guided Reading or requests for more information - just leave them in the comments below or via Twitter. Also, if you use the logos to create other resources which you are happy to share, please get in touch so they can be added to the folder. Hi. I've read the article on how you do Guided Reading and, having seen how children with who struggle with decoding can benefit from the whole class approach, am keen to implement something similar in my Year 6 class. However, I'd welcome a bit more information on how you structure a lesson, e.g. how long do you spend on a text as a class? Do you differentiate the text/ questions in some way when the children are working on their own? Are there any texts you've found that have worked particularly well? Sorry to bombard you but am meeting some resistance to the idea and want to make sure I do it justice. The lesson is structured much like our Maths lessons. We use the RIC short activities as a starter, expecting all children to try the R and I questions and we go through the answers and they can correct their answers underneath. There is then a short input before the children spend 20-30 minutes on a differentiated activity which is aimed at an objective from the new curriculum. We introduce the objective by showing the logo and reminding/questioning children about its meaning. Finally, we bring the learning together, sometimes going through answers, discussing texts, debating etc. The length we spend on a text alters. So we have spent two weeks looking at a picture book, a bit longer on texts like Narnia, Charlotte's Web and Matilda and sometimes single lessons or just a week on song lyrics, poems or shorter stories/texts. Of course those are easier to ensure every child has a copy. We have bought 15 copies of Charlotte's Web and encouraged the children to bring in a copy of Matilda. All the activities and some of the texts are differentiated to allow all children to be challenged by the same learning objective but at their level. My favourite text we used was the poem "Television" by Roald Dahl. Great for Viewpoint questions and debates! Jo, fascinated by this! I have taught y6 for 7 years and still frustrated by guided reading sessions! Have you got a flip chart I could see to get a better understanding of how you structure a session? 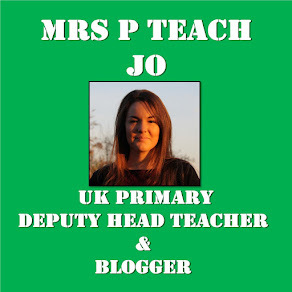 I have added a link to a post which gives a commentary of a sample lesson AND links to planning and resources at the bottom of this post. I'm wanting to do the Firework Maker's Daughter too! 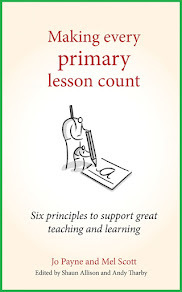 How have you structured your lessons? Could this approach be used with KS1 also? I've used this with KS1 children, we only use the RIC part. We start each guided reading session with a stimulus and then discuss 3 questions - retrieve, interpret and choice. It's been successful so far particularly with engaging children otherwise 'lost' in reading sessions. It's also great to target questions at particular individuals. We are looking at changing our Reading sessions and i have been looking at your ideas and have just been categorising the Y5 new NC statements under the RIC etc headings. Would be interested to know if how I have grouped them is the same as yours for Y5 - do you have a Y5 example plan with them on? Hi, I really love this idea and think it could have a huge impact on our children, not just attainment but also their confidence. We're a four form entry school and I've discussed with with our head and he is keen for me to trial it in my year group (year 4). I've been getting stuck into some planning for for Matilda, but I'm just wondering how you introduced the concept with the children. For example, the logos and the titles? I used to use the AF titles with my year 6 class but it wasn't always easy. How long does it take for the children to get their heads round the new titles? Any help would be greatly received. Thank you. Do you have some examples of planning you could send me? I am looking to introduce a very similar approach to guided reading in my school and would love to have some example plans to show my colleagues. Thanks for the APE Jo, I've been looking for something similar myself. Thanks so much - we are experimenting with a move away from carousel and you have done so much invaluable ground work that it will really help us! Hi do you have any example planning for year 1?